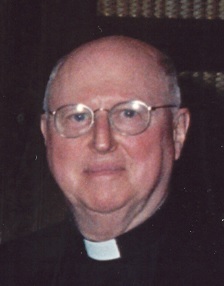 Father William John Sheehan, C.S.B. Father William John Sheehan, CSB died early Sunday morning, November 25, 2018 after many months of failing health. Fr. Sheehan was born January 1, 1937 in Utica, New York to William J. Sheehan and Margaret M. (Horrigan) Sheehan. Fr. Sheehan received a bachelor’s degree from the University of St. Michael’s College of the University of Toronto in 1950 and earned a master’s degree in Library Science at Case-Western Reserve University in 1968. Fr. Sheehan was ordained a priest for the Basilian Fathers December 10, 1966 at Blessed Sacrament Church in Utica, New York by Bishop D. Cunningham of Syracuse, New York. Fr. Bill began his working life as a young man teaching at Basilian high schools in Rochester, New York and Detroit, Michigan. After ordination and further studies he began his career as a librarian at the University of St. Thomas in Houston and then at the Woodstock Theological Library in Washington, D.C. He undertook further scholarship at the Ecoles Des Hautes Etudes of the Institut Catholique in Paris, France. In 1986 he began a long tenure working as the Director of the Incunabula Catalog Department - Printed Books at the Vatican Library in Rome. Fr. Sheehan came to Dillon House, the Basilian Father’s retirement home in Houston, Texas in 2012. His personal warmth and sharp sense of humor, his humility, intelligence, devotion to the church’s work, and his genuine concern for his confreres and many friends, will be keenly missed. May he rest in peace. Confreres and friends may gather together to remember Bill on Wednesday November 28, 2018 from four until eight o’clock in the evening at Bradshaw-Carter Funeral Home, 1734 West Alabama in Houston. A funeral Mass of the Resurrection will be celebrated at St. Anne’s Catholic Church, 2140 Westheimer Road, at ten o’clock in the morning on Thursday, November 29, 2018 where Father Kevin Storey, Superior General of the Basilian Fathers, will preside.